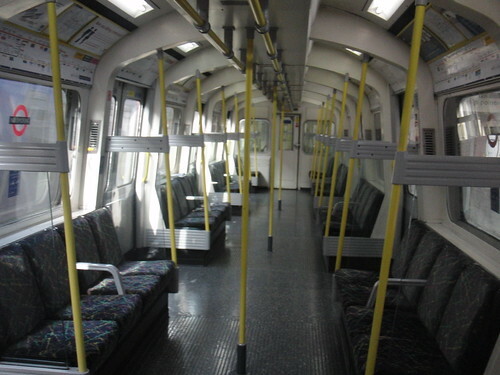 When I stepped into this empty circle line carriage at 08.45am I felt like singing. So I did! No-one smirked, No-one shook their head, no-one asked me to stop screeching. I normally choose to be in a place with few, or no, people present – does that make me an introvert? This scribble was published on Wednesday, March 21st, 2012. You can follow any banter on this scribble with the RSS 2.0 feed. You can share your inspired musings after typing the anti spam word near the bottom of the page. But no Pinging because its too naughty. I like to get on elevators with no one else there, and will sing all by myself! I can be quite bubbly when I want to, or I can be just as flat as two week old opened soda…just depends who I am around! I sing on my bicycle sometimes, which is a moving thinkspace on my way to work, or certainly give vent to the earworms that help me to think. It seems that there’s no-one there but me, or I reckon by the time someone notices that I’m singing, I’m far down the road and completely anonymous. A frame of reference dependent extravert! Kay, Janet and I will be more or less extrovert depending on the social / physical environment.